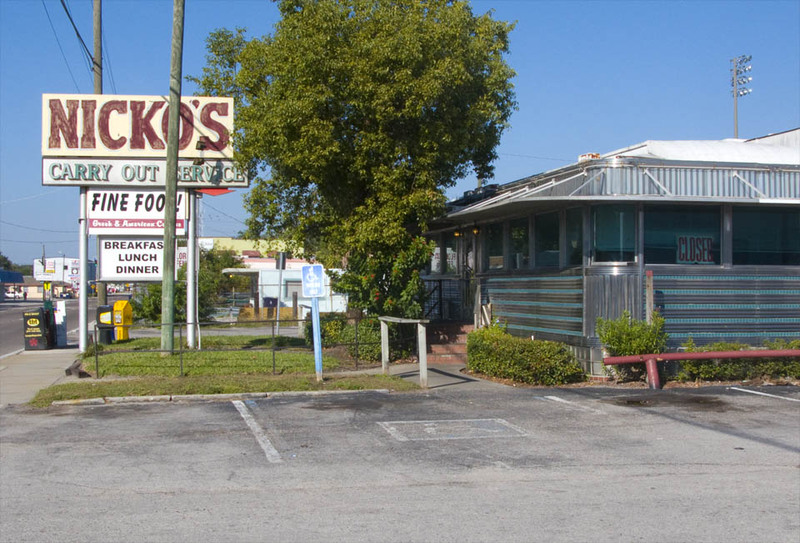 Ayres Diner, now Nickos Diner, is located on North Florida Avenue and is the last remaining Tampa diner of the 1950s. The diner was made famous when Elvis Presley stopped in to have a burger after his concert at the Fort Homer Hesterly Armory. A menu from the historic Ayres Diner can be viewed on the Tampa Bay History Center’s Blog. Wasn’t there another Ayres Diner located just north of I-275 adjacent to the old Jim Walters building? It sat on the West side of the street until the early ’80s. I ate there a couple times with some buddies and I thought that they moved this one over to the NW corner of Himes and Cypress, no? Thank you for sharing. Your grandfather’s legacy will not be forgotten. My grandmother and I were regulars at this place. Mr. Ayers and Donna would carry me through the kitchen to pick out my own bacon. Everybody knew me when I was a little girl. I miss this place more than any other in Tampa. Yes, the best Ayres was on Kennedy right down from where Valencia Gardens used to be – UGH! Forst Goody-Goody, then Whaley’s then…..
that the other Diners needed and because I was too young to drive Mr Ayers would drive to the Diners and I would unload. There were 4 locations at that time. North and South Dale Mabry, Florida Ave, and Kennedy Blvd. I believe it was about 1964. Dear Family and friends of Ayers Family. Hopefully, I can reach my old friend from H. B. Plant High School and who was one of my bridesmaids … Adel Ayers, she should be around 60-61 years old age this year, 2014. I am John Ayers’s daughter. He was my uncle Millard’s oldest brother. 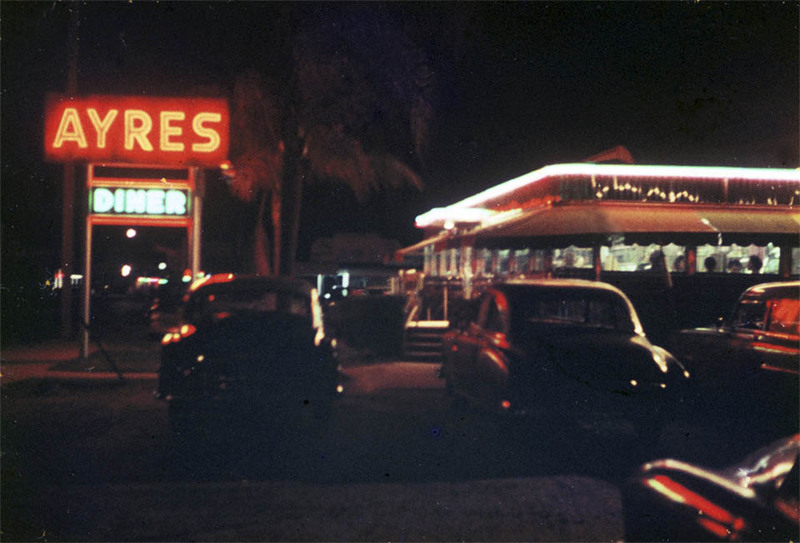 We had a diner in St Pete from 19 49 – 1956. When it closed my dad went to Tampa to run the Lafayette Street diner for uncle Mil. My uncle Calvin ran the Florida Avenue diner. Many of our family worked in the diners. It helped pay my way through college. Those were great times! Thanks for the trip down memory lane. I fondly remember eating at the Dale Mabry diner and another back in the 1950s and 1960s. I loved the atmosphere. Now I find my Dad was right when he said he was good friends with “the Ayers boys” who lived near him and his family in Alabama. I have also discovered one of my great uncles married Mary “Mollie” Louise Ayers (also spelled Ayres); who was the daughter of John Dudley Ayers. I know Dad spoke fondly of all the good times he and the Ayers boys had together. I miss those diners, but have my memories. My Name is Benjamin and i am John Ayers’s Great Grandson. This is so amazing to read thank you all for your comments. Fitting that the Nicko’s sign reads “closed…” given that, in 2018, it’s now closed. My father in law, George Miller, was a cook for Ayres diner from 1961-1976 night shift. He used to walk to work.